Global tech giant IBM took its latest step in leveraging its existing brand power to position itself as an enterprise blockchain solutions leader today, appearing at the The Block Chain Conference in San Francisco. 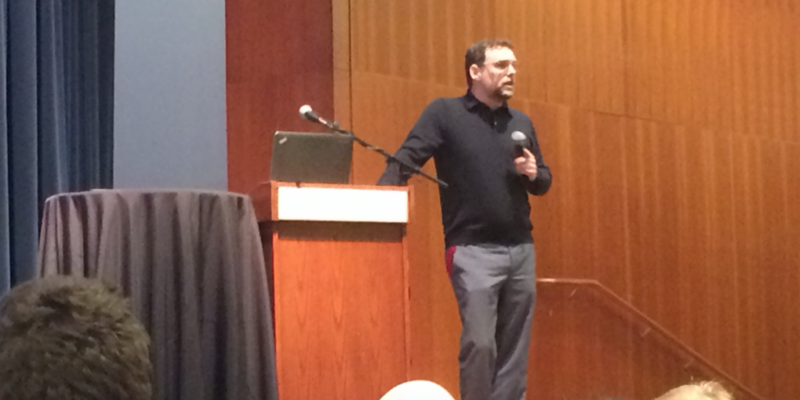 There, IBM’s Global Blockchain Offering Director John Wolpert gave a keynote speech, his half hour talk covering the deficiencies in the approaches being taken by today’s blockchain developers and why he believes a more collaborative approach is needed to bring the tech to market. The talk follows the news that IBM is participating in the Hyperledger Project, an open-source blockchain initiative being led by The Linux Foundation. Announced in December, the initiative boasts 30 brand-name tech and financial firms such as ABN Amro, CME Group and Red Hat, as well as select blockchain startups, among its ranks. 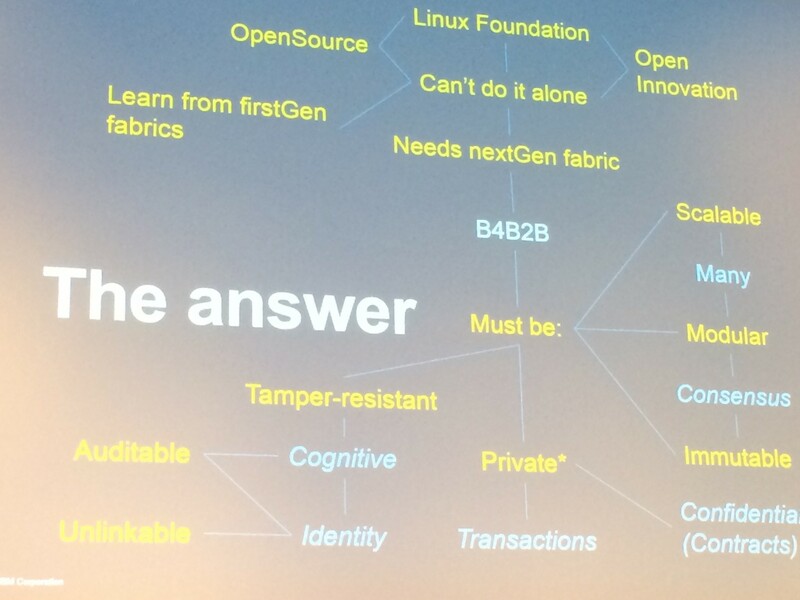 In his presentation, John Wolpert gave an overview of IBM’s thesis on the technology, labeling blockchain projects such as bitcoin and Ethereum as “first generation” versions of a concept that he believes suffer from deficiencies, both in technology and vision, that will hold back their ability to appeal to businesses. The keystone of Wolpert’s vision is that, contrary to the claims of supporters and developers of existing blockchain protocols, the bitcoin blockchain does not function similarly to the Internet. Rather, he sought to position the ideas championed by bitcoin’s early adopters not as radical, but as misguided given that there are centralizing forces on the Internet. In this light, the Internet Corporation for Assigned Names and Numbers (ICAAN), a non-profit created in 1998 to oversee IP addresses, was a frequent touch point. Wolpert framed the goal of the Hyperledger Project as a way to put “all the best ideas”, including those from bitcoin and Ethereum into one solution, a step he suggested is necessary given the needs a widely used transactional protocol would require. “This ain’t email, this ain’t websites. This is your money, this is everything,” he said. Wolpert spent much of his speech attempting to correct what he considered the misconception that IBM is not a company that embraces innovation, noting its history supporting the programming language Java and open-source operating system Linux. Wolpert went on to emphasize IBM’s expertise in the area of consensus algorithms and distributed computing, noting that some of its team members have been operating in the field for 30 years. Though he described Ethereum’s developers as “genius”, he also cited firsthand struggles in IBM’s attempts to build projects on top of these versions of blockchain technology due to issues with confidentiality and privacy. In contrast he sought to position bitcoin as the Napster or BitTorrent for an idea that will evolve to produce products such as Spotify or Netflix. Nonetheless, he praised the project for its ability to popularize blockchain as a conceptual breakthrough in computing. Wolpert hinted at the work of IBM and its peers on the Hyperledger project, which he described with arguably loose language. Wolpert more successfully conveyed the building blocks that he sees as necessary to building an open-source blockchain platform that is as widely adopted for a variety of use cases as Linux. Key to this development, he said, is bringing many different stakeholders to the table, something he contends the Hyperledger Project has already achieved due to the diversity of participants from both within the existing blockchain community and the many industries the technology touches. The message that perhaps most resonated from the conversation, however, was the sheer size of the appetite for blockchain solutions among major companies. When the Linux Foundation announced the Hyperledger Project, Wolpert said, the organization received messages from 2,300 companies requesting to be part of the initiative, an amount that was four times greater than any previous announcement. This rush to innovate, Wolpert suggests, will mean that traditional financial service providers are going to be compelled to innovate aggressively to survive. “A lot of bankers are smart. They’re not going to succeed in every case. But they are going to try to radically improve themselves ahead of the disruption,” he said. Given the increasing number of stakeholders represented, however, Wolpert acknowledged that the way forward would perhaps not be clear or easy.